Can LEDs Challenge LCDs for Indoor Signage? Indoor stand alone and video wall displays have been dominated by LCD technology having successfully vanquished CRT and Plasma display options. But now, fine pitch LED in tiled or modular formats under 2mm are in the market today and offer compelling images – even up close. Can LEDs make a chink in the LCD armor? Can OLEDs or light rejecting projection solutions gain a foothold? Many have bet against LCDs and almost all have lost. Can it be different in this market segment, in particular as high resolution LED flat panels with interactive capabilities vie to compete? The logical answer is that price, performance and fit for the application determines which technology wins. But orderly markets can be disrupted with strategic pricing or distribution deals that are hard to say no to. There is no evidence this is happening in the indoor signage market at this time, but things can change. At the upcoming Display Summit at the InfoComm show, a panel session and special demo will be put together to address the above and many other questions facing the indoor large format display market. LED modules with 1.9mm, 1.6mm and even 1.2mm are available from a number of sources including Unilumen, SiliconCore, Leyard, AOTO and many others. Prototypes of modules at 0.8mm have been shown and roadmaps suggest 0.5mm is feasible within the year. These pixel pitches are in the same range as a FHD resolution LCD panel at 70 to 90 inches. However, thin bezel LCD panels are more typically 55 inches with 1920x1080 resolution, so definitely higher pixel pitch – and headed toward UHD resolution over the next year or two. While LCDs will mostly have higher pixel pitch and better fill factors, the question is; what is good enough and what is overkill. If you are working at the display and have a touch interface, then UHD resolution is not necessarily too much resolution. If you are further than 7-10 feet from the display, then many will argue you are over specifying to buy UHD panels. FHD LCDs or fine pitch LEDs will do the trick. Viewing angles are probably better with the LEDs and they may offer wider color gamuts. The “may” is the catch word here. No LED providers seems to specify the color gamut of their displays as each RGB LED pixel has its own color gamut – which is multiplied by the millions over the full display. LEDs can all come from different bins, so how do you control the color over all of the individual emitters? But remember, not all LED video wall suppliers are the same. Top tier suppliers like Leyard, have a very controlled binning process to help assure color uniformity across the display. Specifying the color gamut on LCDs seems to be easier to control and calibrate, as such tools are often mentioned with these display. LEDs can be calibrated too, but this ability is not touted as much. Color calibration is important if you want to be sure you display the exact color advertisers wants to see, for example. Emissive displays like LEDs and Plasma panels do better in off axis color consistency. On the other hand, maintaining brightness and color uniformity for either of these technologies is an area of some industry debate. I am sure many of you have noticed video walls that have very obvious non uniformities in brightness and probably color. However, there is some disagreement that LEDs are less prone to shifts over time than LCDs. 110-inch LCD Stand Alone Video Wall And let’s not forget price. Fine pitch LEDs are much more expensive than an LCD solution – even with UHD panels. So where are fine pitch LEDs finding applications? Where curved walls are desired, is one area. They are also gaining favor in broadcast as on-camera background displays because of their color temperature tuneability and variable luminance capabilities. Solving moiré issue with LEDs for in-camera applications is important, however. LEDs are also favored where a zero bezel look is desired. 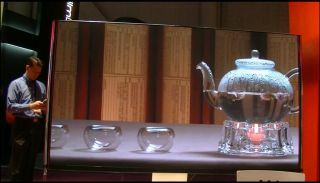 LCDs thin bezel panels today are at 3.5mm and there is talk of going below 2mm. But noone is really talking about zero bezel LCDs, although there are some companies trying to create such solutions. For end users, it can sometimes be hard to evaluate these display alternatives. At the upcoming Display Summit, a panel session (BUNN, Panasonic, Userful and NEC) and special demo will be put together to address the above and many other questions facing the indoor large format display market. For the demo, NEC will bring a 110 inch 2x2 LCD video wall, while Panasonic will bring a 108 inch LED video wall. The same content will be run on both displays, driven by an Ethernet-based video wall controller from Userful. Attendees will be able to evaluate the displays running at different luminance levels and at different distances and angles, voting in an online survey about the characteristics they like best.